JKPSC Result of withheld candidates for MO Unani and Ayurvedic. JKPSC Selection of Range Officer’s Grade-I Forest (Territorial) of J&K Forest. JKPSC eSummon Letter for the Personality Test of CCE-2016. 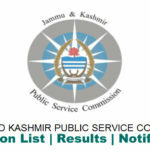 JKPSC Assistant Engineer (Accounts) Departmental Examination, 2019. JKPSC Postponement of Interview for the post of Assistant Professor.